You enter into a large cavernous chamber with high ceilings. It is dimly list with torches on the wall. As you make your way deeper into the chamber you begin to see a massive heap of coins, jewels, and assorted weapons and trinkets. The flickering firelight from the nearby torches makes it seem as if the mass of treasure is moving. After staring at the pile for a moment longer your realize that it is slowly moving. Rhythmically. Almost as if it is breathing. As the realization sets in, you see the pile shift and several gold coins roll away to reveal a pair of large amber eyes with a vertical slit. Roll for initiative. If you weren’t paying attention before, you certainly had your attention directed when the DM said those 3 words that stir the heart of any player, “roll for initiative.” It means that a fight is about to happen. You need to come up with a plan and fast. All those details that the DM was prattling on about - How high was the ceiling? How far can I see into the chamber? Did she say what color the dragon was? - have all suddenly become useful pieces of information. Why did you forget these important pieces of information even though she literally just told them to you? While the game has gone through several editions (it’s currently on it’s 5th) the basic mechanics of the game remain the same. There are all kinds of apps, miniatures, and other bells and whistles you can add on top of the game, but at its core it’s meant to be played with only a pencil, paper, dice, and a book for reference. What surprises people most when I talk to them about D&D is that today - in 2018 where we are constantly bombarded with emails, social media, and the distractions of modern technology - D&D is experiencing a massive rise in popularity. This has caught the eye of some teachers looking to spice up their teaching in much the same way as escape rooms have. Personally, I have always been fascinated with fantasy and fiction because of the author's ability to not only create entire worlds and universes but to also communicate those worlds and universes. Humans have an amazing cognitive capacity for individual creation and social communication. We each have our own unique reality and perspective in our heads. And I mean this in a very fundamental way. Not just that we have different opinions about things, but we literally perceive things differently from one another. Our ability to read a sentence (1), recognize a face (2), or judge the height of a wall (3) are all influenced by our unique blend of knowledge, experience, attention, and physical abilities. We have complicated and elegant individual realities. Rather than living out our lives in our own little worlds, however, we share our worlds with each other through language. As individuals we have varying levels of comfort and skill with doing this, but as a species we seem to have a biological compulsion to do so. Language, the ability to make real that which previously only existed in our heads, seems to be a uniquely human trait (4). To me, great works of fantasy and fiction stand as a shining testament to human cognition. Why should teachers or researchers care about D&D or any other role-playing game? As a teacher and a DM I see a lot of similarities. In both settings I attempt to create an environment in which people can develop skills and be empowered to shape and interact with the world based on those skills. I am also met with similar challenges and questions. Why do people remember some of the things I tell them and why do they forget the more important things? What makes some things more engaging an interesting and does that engagement and interest lead to better decision-making and memory? I think D&D and other tabletop role-playing games are worth examining because they can be so similar to classroom learning. What is the best way to describe something so that players will be able to interact with it in the moment and remember crucial details later? I think this can be broken into 2 big parts. 1. How do we pay attention to and remember information over the short term? 2. How do we remember and use that information later? How do we pay attention to and remember information over the short term? It’s almost impossible to talk about how information is remembered over the short term without referencing The Magical Number Seven Plus or Minus Two (5). This paper is classic in cognitive psychology for a few reasons. First, and most importantly from a scientific perspective, it’s an incredibly useful meta-analysis wherein the author summarizes the evidence from a number of published studies to discern a larger pattern. Second, it was written by an important figure during the cognitive revolution in psychology. I mention this historical tidbit to give some context for the perspective taken in this paper. This is written from an information-processing perspective. Within psychology the information processing approach was developed in the 1950s and 1960s in enthusiastic response to the advent of computers. This approach uses computers as a metaphor for cognition, where the brain is the hardware and cognitive processes are the software. If our brains are like a computer, and we measure the success of the computer by rate of bits it can process, then how many bits per second can the human brain process? So the fact that we can hold about 7 pieces of information in our mind at a time comes from this approach, and this paper specifically. So this answers the first question, right? Eh… not exactly. It turns out that it’s really hard to define a what a piece of information, or a bit, or a thing, or a stuff is. To answer this we have to tease out what are the limits or constraints of our processing and attentional systems, and what are the limits or constraints of our storage or memory systems. And that, as the saying goes, is a different ball of wax. I’ll attempt to summarize and explain the last 60 years of research on short term memory using the tools of my people: arrows and boxes. So, first a thing happens and presumably grabs your attention. Maybe your attention is already on it. Maybe you are giving your full attention to your DM describing the dragon’s lair because you are already 100% invested in this story and encounter and want to note everything about it. Maybe. For now, let’s just assume your attention is directed. After that you take in information and sort of hold onto it in the sensory store (7). Think of this as like the after image when you look at a picture. It lasts somewhere between 0 and 1 second. Just long enough for your brain to process it as a thing that happened. After that we can deal with things that happen over the short term. As far as our research tells us, short term is 1 - 2 min. Anything that is not short term is long term. So, to remember something 10 min or 10 days from now requires dipping into LTM and a slightly different set of processes. So, this is all fine except it turns out that what we direct our attention to is determined by the current context and our understanding of the current context is determined by our past experiences. That’s right. Hold onto your butts, the arrows GO BOTH WAYS. An important thing to know about attention is that if you don’t pay attention to something you can’t learn it. This may seem obvious, but we take our attention for granted all the time. I could write a whole post about this alone, but if you’re interested in the ways in which our attention tricks us watch a few cool videos from Dan Simons. If your players (students) aren’t paying attention it’s like never happened for them. Similarly, if you are attempting to multitask and you’re switching your attention back and forth, you are going to miss crucial pieces of information. Put away your cell phones, cut down on side talk, and look at the person who is talking. Our ability to focus and block out distractions is one of the major limiters on what we can learn and work with in the moment and over the long term. Alright, we are paying attention to the DM’s description of the dragon lair. How do we process information that is being spoken and/or shown to us? Now we are entering the world of short term memory. More specifically, we’re entering into the world of the flashier, more active cousin of short term memory - working memory (WM). WM is our ability to not only hold on to, but to use and manipulate information over the short term. Models of WM include 3 main components: verbal stuff (phonological loop), visual stuff (visuo-spatial sketch pad), and some sort of control system directing attention (central executive) (8). An important thing to know is that our verbal component of WM ends up limiting a lot of our ability to process information. While you are reading this you have an internal voice reading the words. Yes, you! The weirdo talking to yourself as you read. The truth is everyone has that internal voice. This makes it hard to read something, think something, and listen to someone else’s voice at the same time. We have one internal voice and it can only be saying one thing at time. BUT we can talk to ourselves while we look at non-verbal pictures. This helps explain why dual-coding works. Your DM can show you a picture of the dragon’s horde while describing it in more detail and you’ll get the benefit of both the verbal description and the visual information without much processing conflict. On the other hand, if you are trying to decode an unfamiliar map (by using that helpful inner-voice!) while your DM is describing the room, you may run into some troubles deciding which thing to pay attention to and process. It’s important to note that not everyone processes information at the same speed - some people process information a bit faster or a bit slower. People have different WM capacities which changes their ability to process information over the short term (9). However, this variance in WM capacity is normally distributed. This means that most people will process information at pretty much the same rate, and only a very small percentage of people will be very slow or very fast processors. In other words: if you use a normal, conversational speaking rate to present information most people will be able to process and remember what you just said. If you are unfamiliar with D&D “Roll for initiative” doesn’t hold much meaning for you. If you do play, however, that phrase is a clear signal of what’s about to happen. You have developed a specific set of expertise, a schema, that allows them to better understand, remember, and direct their attention in this context. This answer tends to be a bit more complicated than what most people want. We like concrete things that we can latch onto, real hard numbers, not discussions of how psychologists in the 1950s and 60s felt about computers and arrows (they freaking LOVED them). So, like, 7 plus or minus 2 stuffs? How do we remember and use that information later? To answer this question we first need to have a talk. We need to talk about what your memory is for. Your memory is not for remembering things. If you think memory is for reflecting on past events or for storing some sort of accurate record of past events, then you have probably been very frustrated with your memory. We are actually pretty bad at accurate record keeping with our memories. We remember things that never happened (10), change our story after being questioned (11), and simply forget most of the information (12) that was presented to us. We are very bad at recording. So what are we good at? We are very good at predicting and using past information in service of the present. Once we start to think of our memories as predictive and reconstructive, rather than reflective and reproductive, then our abilities start to make more sense. Our ability to remember and use information improves the more times we have to remember and use that information. Retrieval, spaced practice, and interleaving are all examples of how our memory system is designed to predict the future rather than record the past. If we have to remember it once, our memory system figures we might need to remember it again. Might. But if we have to remember something over and over again, our memory system will flag it as something that seems to be important. For example, consider these two pieces of information. The name of the innkeeper, Garryl, your DM mentioned 2 weeks ago. The name of the town drunk, Frakus, who every person in the inn has a story about. Which are you more likely to remember? Whether you want to or not, you are going to think of Frakus when you think of the inn. Your memory system, your prediction machine, has learned that this piece of information is relevant to your ongoing discussions. The name of the innkeeper? Probably not as important. Repetition, especially repetition spaced out over time (13), is one way that our memory system figures out what information will come up again in the future. Another piece to understanding how we remember and use information over the long term is to understand that memory is not static. We do not store perfect representations of ideas in our head that are then later accessed by searching for the right term. Our brains are not a library. Our brains are not google. Instead, our brains are dynamic, living organisms that respond in real and edited time to internal and external events. We can update, change, and revise our memory and understanding the more we learn and interact with our environment. Our cognitive system is less concerned with an accurate representation of our world and more concerned with a useful representation of our world. So what information is useful to us? The information that we most easily glom onto seems to be social information. We remember names associated with professions better (14), we remember narrative passages more than expository passages (15), and we are logic savants when it comes to reasoning about social situations but complete dunces when we reason about non-social things. My favorite example of this is using a few simple logic problems (16). Which card(s) do you turn over to test the rule? On one side of the card is a person’s age. On the other side is the drink they are having. The rule is a person must be over 21 to have alcohol. For most people the second logic puzzle is MUCH easier. People immediately know which cards to turn over to find the rule violator. In both scenarios, the underlying logic is the same. However, it takes a strong working knowledge of deductive reasoning to work out the answer to the first one (turn over cards “7” and “D”). Somewhat surprisingly, we are better with logic in social situations than in non-social situations. Finally, we acquire expertise and use schemas to help us remember and use information over the long term. This can be very helpful, because our previous experiences can help us categorize and make sense of our world. “Roll for initiative” serves as an important cue for a series of actions and planning that we have to take in a game. However, our expertise and schemas can get us into trouble sometimes. We can develop rigid mindsets, functional fixedness (16), that makes it difficult for us to find new and creative ways to solve problems. As a DM, be mindful of how you have structured encounters or puzzles in the past. If there was a lot of similarity, then players might have trouble solving a different kind of problem simply because they’ve developed functional fixedness. How do we remember and use information over the long term? The short answer is: By remembering the useful stuff. How does our memory system figure out what’s useful? How do I get my players to remember and use what I tell them? Cut down on side chatter and phone usage (18). Direct their attention towards you. Present information both verbally and visually (19). Pictures of rooms and creatures with descriptions help! Present information in short bursts (9). You can monologue for 20 minutes about the history of an area if your players find it interesting and it adds narrative flair. But if you want them to remember and use that information immediately afterwards, keep short. Quiz your players on important information (20). Have NPCs (non-playing characters, essentially the DM acting out different people in the world) ask about the players’ latest adventure, design puzzles based around key facts, and, heck, even literally quiz them at the end of a session. If a concept or person is important than it should show up more than once! The name of the evil high lord who the players are going to eventually fight should come up pretty often. Also see above re: building up experiences. To get the most out of retrieval and repetition, space it out (13). Introduce the evil high lord a few sessions before the players have to fight him and drop some more information in each session. Build tension AND memory. A long list of things in a room is going to be hard for people to remember. A story about how people interacted in the room, or the social or motivation behind having things in a room, would have a better show at being remembered (15, 16). Be mindful of how you have set up expectations and scenarios in the past. If the solution to every problem so far has been “I hit it until it dies or gives me what I want” then don’t be surprised when players only use that solution. It’s the one you taught them (17). Butcher, K. R. & Kintsch, W. (2013). “Text comprehension and discourse processing” In Healy, A, Proctor, R. W., & Weiver, I. B. (Eds), Handbook of Psychology: Experimental Psychology (pp. 578-604). Hoboken, NJ: John Wiley & Sons Inc.
Wan, L.,Crookes, K., Dawel, A., Pidcock, M., Hall, A., & McKone, E. (2017). Face-blind for other-race faces: Individual differences in other-race recognition impairments. Journal of Experimental Psychology: General, 147(1), 102-122. Taylor, J. E. T, Witt, J. K., & Sugovic, M. (2011). When walls are no longer barriers: Perception of wall height in parkour. Perception, 40(6), 757-760. Chater, N. & Christiansen, M. (2010). Language evolution as cultural evolution: How language is shaped by the brain.WIREs Cognitive Science, 1(5), 623-628. Miller, G. A. (1956). The magical number seven, plus or minus two: Some limits on our capacity for processing information. Psychological Review, 63(2), 81-97. Atkinson, R. C. & Shiffrin, R. M. (1968). “Human memory: a proposed system and its control processes” In Spence, K. W. & Spence, J. T. (Eds) The psychology of learning and motivation (89-195). New York, NY: Academic Press. Sperling, G. (1960). The information available in brief visual presentations. Psychological Monographs, 74, 1-29. Baddeley & Hitch (1974). Working Memory. Psychology of Learning and Motivation, 8, 47-89. Engle, R. W., Kane, M. J., & Tuholski, S. W. (1999). Individual differences in working memory capacity and what they tell us about controlled attention, general fluid intelligence, and functions of the prefrontal cortex. In A. Miyake & P. Shah (Eds. 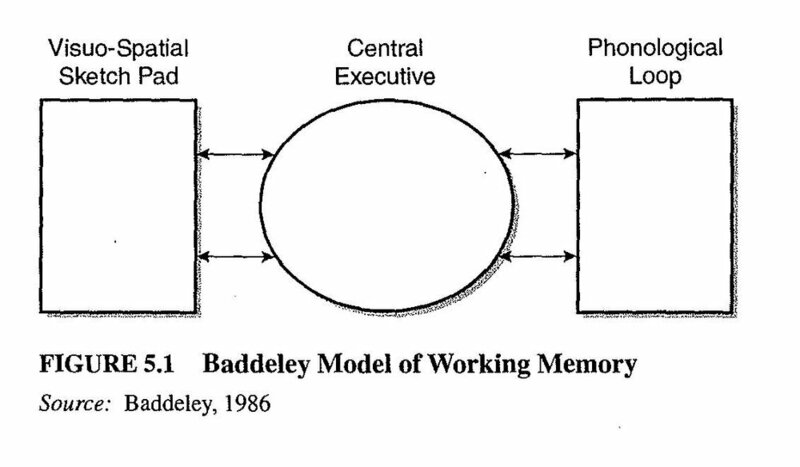 ), Models of working memory: Mechanisms of active maintenance and executive control (pp. 102-134). New York, NY, US: Cambridge University Press. Roediger, H. L. & McDermott, K. B. (1995). Creating false memories: Remembering words not presented in lists. Journal of Experimental Psychology: Learning, Memory, and Cognition, 24(4), 803-814. Loftus, E., F. & Palmer, J. C. (1974). Reconstruction of automobile destruction: An example of interaction between language and memory. Journal of verbal learning and verbal behavior, 13(5), 585-589. Ebbinghaus, H. (1885) translated (2013). Memory: A Contribution to Experimental Psychology. Annals of Neurosciences, 20(4), 155–156. Anderson, J. R., & Schooler, L. J. (1991). Reflections of the environment in memory, Psychological Science, 2(6), 396-408. Cohen, G. (1990). Why is it difficult to put names to faces? British Journal of Psychology, 81, 287-297. Wolfe, M. B. W. (2005). Memory for narrative and expository text: Independent influences of semantic associations and text organization. Journal of Experimental Psychology: Learning, Memory, and Cognition, 31(2), 359-364. Cosmides, L. (1989). The logic of social exchange: Has natural selection shaped how humans reason? Studies with the Wason selection task. Cognition, 31, 187-276. Duncker, K. (1945). “On problem solving” Psychological Monographs, 58(5), 1-113. Mayer, R. E., & Anderson, R. B. (1992). The instructive animation: Helping students build connections between words and pictures in multimedia learning. Journal of Educational Psychology, 4, 444-452. Roediger, H. L., Putnam, A. L., & Smith, M. A. (2011). Ten benefits of testing and their applications to educational practice. In J. Mestre & B. Ross (Eds. ), Psychology of learning and motivation: Cognition in education, (pp. 1-36). Oxford: Elsevier.